Incumbent Al Abdelaziz declared victory in the 6th Ward election early Tuesday night. He defeated his opponent, Jeyss Abreu, in a landslide victory. Abdelaziz received 2,607 and Abreu had 624 votes, according to the incumbent’s campaign. Abdelaziz said he is willing to work with Abreu to improve the 6th Ward. “To my opponent, I look forward to working with you,” Abdelaziz said in front of his supporters in his brief victory speech. Abreu was badly outspent in the race. His campaign reported raising just $1,100 in the race. Abdelaziz raised $35,300. By late October, Abdelaziz had spent $13,400 to defend his seat. Abreu issued biting attacks against Abdelaziz in a televised debate. His campaign also released a controversial campaign flier that identified Abreu as a Christian and Abdelaziz as a Muslim. Abdelaziz denounced the flyer as divisive. “The other side got a little dirty, but the 6th Ward will never be divided,” said Abdelaziz in his victory speech. Abdelaziz was appointed to the 6th Ward seat by the City Council in July. He replaced mayor Andre Sayegh. Sayegh had to vacate the seat after winning the mayoral election. Sayegh endorsed Abdelaziz in the race. The mayor stood behind him as he delivered his victory speech. Abdelaziz received harsh criticism from Abreu for being too close to the mayor. Abreu described Abdelaziz as a “puppet” and slammed him for voting in favor of the mayor’s 2-percent tax increase. 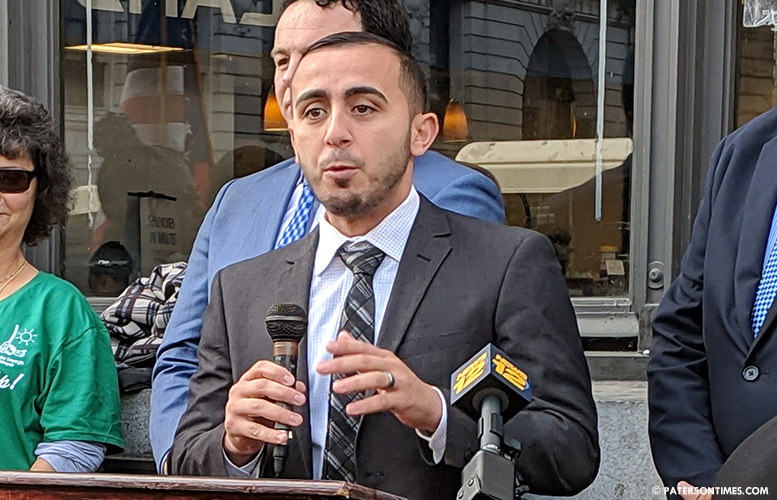 Abdelaziz, works as supervisor of athletics at the Passaic City school district, began his political career as a close ally of Sayegh. But, both men were divided up by former mayor Jose “Joey” Torres. Torres supported Abdelaziz in the 6th Ward in 2016 to oust Sayegh. His efforts failed. Both Sayegh and Abdelaziz were estranged for a while until the two men became allies again in 2018. Both men worked to put a police substation at the South Paterson Library — an idea first proposed by Abdelaziz. Abdelaziz cited this, working with his former foe, Sayegh, in his speech when extending an olive branch to his vanquished foe. Vote tallies updated on Nov. 8, 2018.